ScHoolboy Q thinks A$AP Rocky is goofy for his Calvin Klein billboard. With ScHoolboy Q's album release on the horizon, we've been fortunate enough to receive two new singles from the TDE rapper in recent weeks. "Numb Numb Juice" and "CHopstix" have both dropped, with the latter being granted a new set of visuals yesterday. There is still a cloud looming over the imminent release of Q's project, which was pushed back after Nipsey Hussle's untimely death, but the rapper seems to be finding things to do in his spare time. Q is an avid golfer, which he reiterated during a recent interview, and when he's not putting on the green, he can usually be found trolling his close friends online. Such was the case when he slid into A$AP Rocky's comments box to clown him for his recent Calvin Klein billboard. 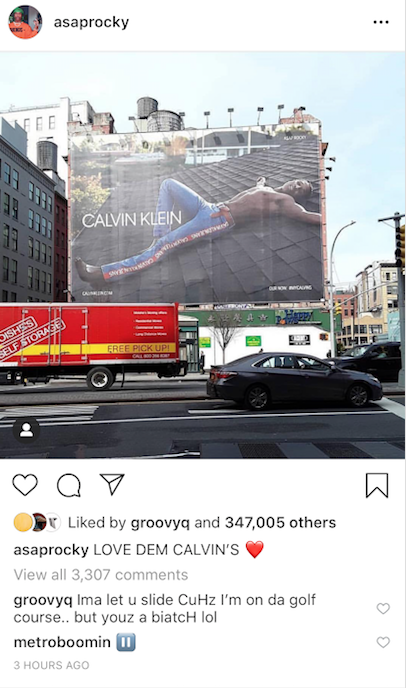 The AWGE member decided to show his fans one of his new billboards for Calvin, showcasing their jeans collection and laying down on a rooftop. The image appears on a busy street, maximizing exposure and once ScHoolboy Q saw the photo, he just had to speak his mind. "Ima let you slide CuHz I'm on da golf course... but youz a biatcH lol," he wrote. Rocky has been partnered with Calvin Klein for a minute and this isn't the first time that ScHoolboy Q has gone after him for his modelling work with them. Back in September of last year, Q commented on a different picture of the Harlem rapper rocking white Calvin Klein underwear, telling Rocky to stop texting and calling him.